Following on from our conversation last night I’ve put together the Family Tree for the Atkey Family and will publish it (with free access) on my web page (www.timedetectives.co.uk) later today. Hope it is of use to anyone interested in the Atkey Family. Ok the family tree is ready to be downloaded if anyone is interested, just go to http://www.timedetectives.co.uk and click on the “Canada Atkey” tab then click on the pdf file for download. Well now a year later I met alfred just a week ago, at this time he explained that his name was alfred atkey, and that he was an amateur musicologist traveling Canada (yes, he’s in the Yukon) collecting money for female composers of violin concerti. He feels it is a lost art. Let it be said that he’s not only in fine condition, clean and free of odors, but that his clothing is only more delightful than when you found him. He is wearing one which rubber boot and one tennis show. He is also wearing every item of clothing that he owns such that he appears like a cartoon character with his little head popping out of a mound of clothes such that I’m not sure how he can move. I gave him $20 on general principles, and a cup of ice since it was a hot day. A bit up the road I stopped in at Jakes Corner in Yukon (Jakes crossing) and spoke with a couple waitresses at this must see gallery / restaurant / ? After visiting with the eccentrics at the lunch table I asked on a whim if any of them knew Alfred. They burst into laughter and said he’d spent the afternoon at their place a few days before. Apparently he’s using the bicycle more as a luggage carrier than for himself. They agreed that he was a delight, remarkably clean and alert for a man living outdoors, and somehow seemed to avoid the numerous human predators such a man might fall victim to. Give me an email address and I’ll send along current photos. I’ve made a facebook page for Al. It’s found at Facebook under Alfred Atkey, or his username of al.atkey@dancetc.com. Hi Just a quick update on Alfred. As of Sunday April 25th he was in Fort St John. I saw him on the road side making little to no progress so I stopped and asked him if he was alright. What a delightful experience that turned out to be. He was fine, as it was evening and he had no place to stay i put him into a motel for the night. He said he was headed to Red Deer to stay with a brother. I told him if I could talk to his brother I would put him on the Grey Hound. Haven’t heard from him so I imagine he’s on the road south. What a character. Just wanted to set the record straight that my father’s first wife was not our mother. Alfie should have at least known his mother’s first name even if he didn’t know her maiden name. If Irene had been his mother, Alfie would be 90 years old by now – he is actually 67. She ran off on my father and when he didn’t hear from her for many years, he went back to the homestead near lone rock and worked on his music career. He enlisted in the second war, was assigned to Downsview, Ontario as a link trainer for new pilots. It was in Toronto that he met our mother, Dulcie May Boadway. They married in August of 1942 and had five children. The second child, George Vaughn only lived two weeks. They lived in Toronto, Edmonton, Yellowknife, Whitehorse, Lloydminster, and finally Toronto again where my father passed away at the age of 76 in 1971. Mom followed at the age of 59 in 1975. They are greatly missed. I have tried to contact Donna via this site without success. The e-mail sadly bounced. If you drift back to this blog to check up on your brother, please drop me a line via the guy who runs the site. I write biographies of WW1 aircrew and have had an interest in your father for a couple of years now. Fingers crossed you come back to revisit some time. Re. Request of Mike A. I don’t believe Donna Atkey has email since retiring from work. She can be reached at 905 271-7129 & I’m sure would be very pleased to speak about her father. This is great, thanks for taking the time to pass this on – the number connects to an address in Mississauga, Ontario. Does this sound somewhere about right? I have a policy never to pester people unless they have given some impression they want pestering, so a letter works best for me. Hi everyone,Met Al last night at the Petro-Canada on Hwy 1 west of Calgary.We talked for a while in the restaurant there.As I am truck driver now,and a bike courier from a long time ago,we shared a few stories of cycling and life on the road.He told me of his father,and I shared some of my west coast pilot stories.He seemed very interested in the history of Blatchford Field(City Centre Airport -Edmonton)I worked there for a while at the Edmonton Flying Club.I told him he should write a book of his life and adventures,he seemed to smile at the idea.As I write this now,as song by a fellow by the name of Red Sovine comes to mind,the name of the song ‘Big Joe and Phantom 309’.To those who have not heard it,look it up on You-Tube.Who knows…………..you might see Al some night on lonely highway…….safe travels Al. I just met Alfred Atkey tonight walking in Stony Plain,Alberta. He is a present man to talk with and he is very proud of his father and has such a beautiful demenor … November 24, 2016! Fri. JAn 27 , 2017 6:30am. Intrigued by the orange bicycle helmet my buddy Wordie and I stopped on the roadside in Crow’s Nest Pass to aid a fellow traveller . Fortunately for us the gent regaled with tale after tale for miles on end ! The last we saw of him he was in a Walmart Parking lot heading for a CIBC.Some days later we discovered we had been in the company of a truely unique Canadian ! So great to find that he has a following here on FB. we recently encountered Mr Atkey in grimshaw alberta! Today we were having a staff lunch and he was in the cafe! Intuition told me to ask his ask him his name. My co workers bought him lunch and gave him some cash. I met Mr. Alfred Atkey this morning as he was travelling on his bike through Devon, Alberta on his way “south” for the winter. Bought him breakfast at the local A&W and spent several hours with him before driving him to Leduc McDonald’s, where he hoped to catch a ride with someone heading towards Red Deer. Also gave him a new can opener, fifty bucks and a 26-page print-off of his family tree (he was delighted!). He seemed to be sound of body and mind and was a profound inspiration to me as I strive towards a much simpler lifestyle. He has been life changing! Blessings upon him! Sept 21/17 Spotted Alfred pushing his bike in Ponoka, AB in the rain. He was wearing multiple layers of clothing with numerous plastic bags tied to his handlebars. He told us he was heading south so we offered to give him a ride to Red Deer, but since we were driving out to B.C. the following day, we brought him home, gave him a bed & laundered his clothes. A kindly lady at the local KFC had given him a chicken dinner which we supplemented with tea and his own packet of hot chocolate mix. Sep 22/17 loaded Alfred and all his possessions into our truck and eventually dropped him off at McDonalds in Revelstoke. He told us he was headed toward Prince George where an acquaintance had a ranch where he could spend the winter. He indicated he was estranged from his brother in Red Deer but hoped his surviving sister from Ontario would join him sometime in the west. He appeared to be in good health and had good appetite. He entertained us with numerous anecdotes and stories including one where he said someone had given him toothpaste and he said “what do I need that for, I only have one tooth” which in fact was the case. He spoke a lot about his father and his father’s time in the armed forces. He is knowledgeable on many subjects, particularly music. Alfred is refreshingly able to accept help from strangers without over the top gratitude. A one of a kind character and we wish him God speed. I’m a militaria collector from the UK and have a pistol that was presented to this mans father Captain Alfred Atkey in 1918. It is engraved that it was presented by ‘The L P C’ and am trying to find out who or what theses initials stand for. As he was from Canada I wondered if there were any clubs or institutions with these initials over there. I initially thought it may have been ‘The London Gun Club’ but have drawn a blank so far. How would I access the family tree that is mention in previous posts? Any help would be appreciated. Further to my previous post it should read ‘London Pistol Club’ !! I am so glad to hear of Al’s health and continuing adventures. He lived in Alaska for over 25 years and endeared himself to many. My husband and I travelled the Alaska highway in January 2017 and stopped in many places looking for Al. Everyone seemed to know who he was but hadn’t seen him in ages. If anyone sees Al please give him a loving “hi-ho” from his friends in Alaska. We miss him. My name is Dave, a trucker from Lethbride, AB. This evening of 14 May 18 I saw a man pushing a bicycle on highway 40 south of Grande Prairie, AB heading south, and dropped my trailer at a stop and bobtailed back to see if he was alright as he was moving slow up a hill on a busy stretch of narrow road. 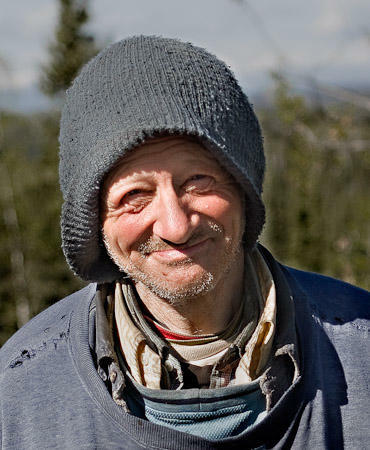 It was Alfred Atkey, and he told me many stories on the drive to Grande Cache where he wanted to spend the night (and possibly a day or two to rest up). He is In good spirits and on his way to Mount Robson, BC to work for the summer on a ranch. He is set up at a room at the generous Bighorn Motel tonight in Grande Cache, AB, and I bought him some dinner and some supplies for when he decides to continue on. He mentioned that he was on the internet and over dinner I found this site and told him that many people are thinking very kind things about him. He is very happy to know this, and is very happy to have an internet legacy. I just met Alfred when I was going to the post office in Grande Cache. He is so interesting to talk to! Very friendly! I love how he’s wearing about 4 pairs of pants and 5 shirts on such a hot day. He said he didn’t mind the heat. I feel happy that I met such a unique person. I might track him down later to have more chats with him.